Because Sanam knows that I love all things anteater, she correctly assumed that I’d be more fascinated than repulsed by the following image. Spoiler: It’s fucked up. Given that you probably saw the image immediately after if not while you were reading the above sentence, that spoiler warning was not especially effective. I realize that much. LOL Pretty tame compared to a lot of invaisive Manga type pictures stumbled across on the internet. Particularly involving tentacles... seems to be a theme. 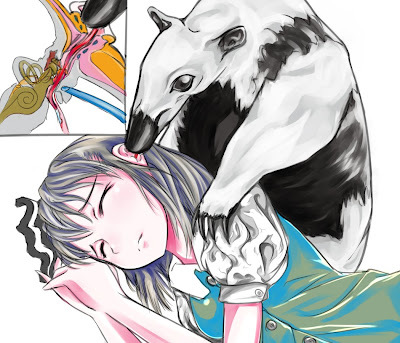 It's an awesome anteater tho. That's just bizarre. The little picture showing the path of the tongue is really what makes the image. The picture is by a Japanese artist who goes by "rukka". The female character is Youmu Konpaku, from the primarily top-down bullet hell shooter series "Touhou". I feel bad that I know this. On a side note, as far as bullet hell goes, Touhou is pretty sweet. I'm hard-pressed to say which is the best game in the series, though, the one that's indicative of the series as a whole.